The Euro project area covers ~3,478 square kilometres of exploration licences and applications in the Tanami Region of the Northern Territory. The project is along strike of, or contains structures parallel to, the Trans-Tanami Trend which is the regional control of major gold deposits in the area, including Newmont Mining’s Callie Gold mine. The land surface is generally flat with a thin covering of windblown sand over variable thicknesses of transported Quaternary sediments. Laterite exposures form low rises. There are minor outcrops of underlying rocks, however outcrop is limited to less than 2% of the project area. 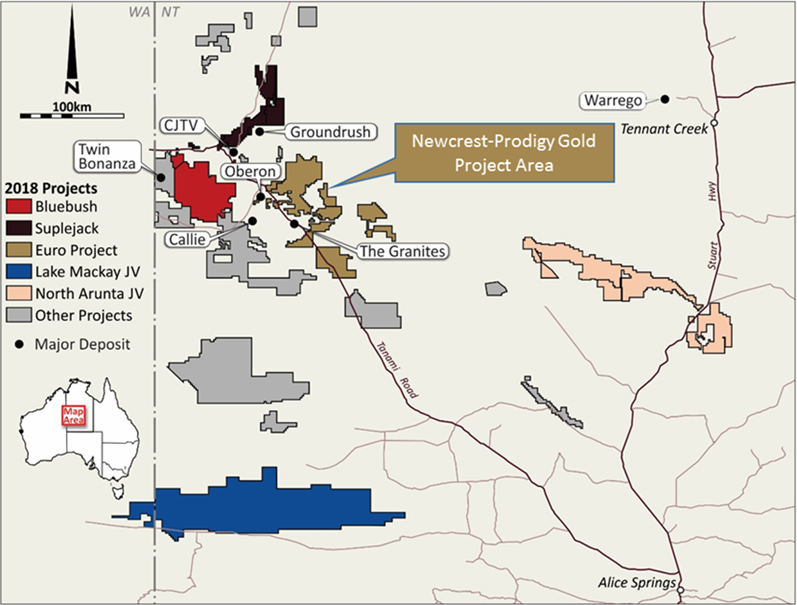 Prodigy Gold entered into a Farm-in Agreement with Newcrest Mining during July 2018. Work programs for Euro are currently being permitted, with initial activity focusing on the Dune target, two kilometres to the south of the Newmont Oberon deposit. Previous exploration has primarily been soil sampling and patchy reconnaissance drilling with 10 of the 17 tenements in the project having no drilling in the last 20 years. The shallow veneer of transported sand covering 90% of the area and the limited previous work has resulted in the area remaining untested or ineffectively tested. The majority of the project area has been subjected to no exploration as the early focus shifted to the Titania/Oberon and Ptilotus discoveries. Strike extensions or potential repeats of these deposits exist within the project area.